EPHESIANS 4:32 KJV "And be ye kind one to another, tenderhearted, forgiving one another, even as God for Christ's sake hath forgiven you." 29Let no corrupt communication proceed out of your mouth, but that which is good to the use of edifying, that it may minister grace unto the hearers. 30And grieve not the holy Spirit of God, whereby ye are sealed unto the day of redemption. 31Let all bitterness, and wrath, and anger, and clamour, and evil speaking, be put away from you, with all malice: 32And be ye kind one to another, tenderhearted, forgiving one another, even as God for Christ's sake hath forgiven you. And bee ye kinde one to another. tender hearted, forgiuing one another, euen as God for Christs sake hath forgiuen you. And be kind to one another, full of pity, having forgiveness for one another, even as God in Christ had forgiveness for you. and be to one another kind, compassionate, forgiving one another, so as God also in Christ has forgiven you. 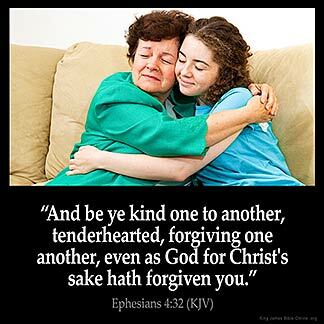 And be ye kind one to another, tender-hearted, forgiving one another, even as God for Christ's sake hath forgiven you. On the contrary learn to be kind to one another, tender-hearted, forgiving one another, just as God in Christ has also forgiven you. And be kind to one another, tenderhearted, forgiving each other, just as God also in Christ forgave you. and be ye togidere benygne, merciful, foryyuynge togidere, as also God foryaf to you in Crist. and become one to another kind, tender-hearted, forgiving one another, according as also God in Christ did forgive you. 4:32 As God, showing himself kind and tenderhearted in the highest degree, hath forgiven you. So often it is forgotten how the point is Jesus showed us how to live our lives for 33 years , before suffering on the Cross for our sins . Living a more focused life, and lifestyle of forgiveness isn 't easy, but so worth it in the end. The way Jesus forgave is before I ever did anything. With Holy Spirit help I can do the same thing. I cannot do it on my own . It is Quite the Blessing to forgive as I have been forgiven. I 've read the entire Chapter 4 I come from Lying to my spouse and fornication elsewhere when I read the entire chapter I realise how much I destroyed God 's grace and trust. I think of how we are under Grace and not the law because God saw it fit for us to have our sins forgiven. To forgive those whom I clearly have hatred and ill feelings towards for how they have built their relationship with me. Then I think of the disciples asking Jesus how are we to forgive 70 times 7 and I lack this to. How can I be called God 's child still and be forgiven. I 've been wrestling in prayer asking God to forgive me every second for what I have done. I 'm reminded of my mistakes everyday being separated by the 1 person who matters yet I destroyed the very next chapter to this. "God help me find your clemency so that I can turn my life around. " When we sit and think about how God freely forgave our sins by means of the sacrifice of his son Jesus, it helps us to be able to forgive others. This is what is pleasing to God. Sometimes it can be difficult to forgive, that why we have to pray for help to achieve this.